Here's a post looking at Trojan Records label designs to aid the correct assigning of Reissue and Repress to UK LP releases; as there isn't a definitive reference on the subject, I trust the combined knowledge of whoever reads this with input from fellow Discogs contributors will help distinguish similar designs harder to identify at first glance. The intention is to start from UK LP releases between 1968 and the present day and possibly move on to singles later. The first few releases prefixed TRL have orange paper labels with the Trojan crown emblem design and the caption 'A Duke Reid Production Jamaica' blacked out below it, the Reid credit remained of some releases that were produced by others and Here Comes The Duke LP has the credit blacked out too. Later 1968 titles have no slogan nor the back overprint. Sleeves are laminated at the front [around the spine and over a small part of the rear] and often credit Senol Printing Ltd., the Trojan Records address given is Music House, 12 Neasden Lane, London N.W.10. 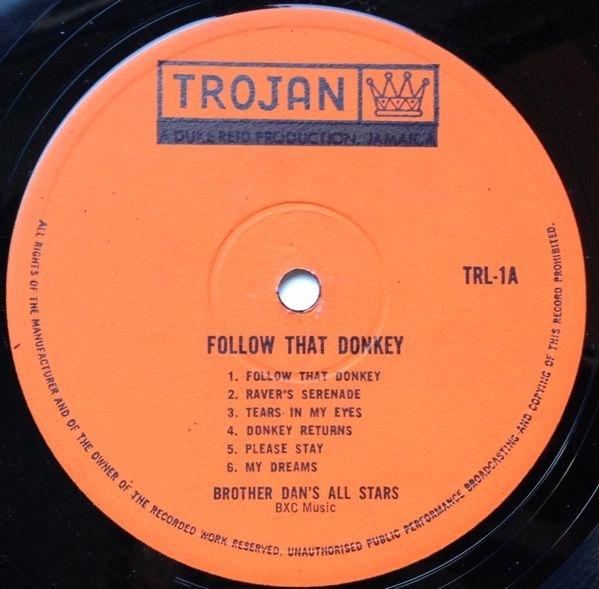 All original '60s pressings are by Orlake Records, also responsible for repressing many Trojan releases into the '70s. The rough textured labels with 1.4" diameter indentation ring and [sometimes] a smoother band around the label perimeter are indicative of the manufacturer in conjunction with the + sign used as separator in the stamped [initially] or etched matrix [at what point this changed is still unclear]; some Orlake pressings may also have an O or an OR at the opposite side of the run-out area, sometimes this is faint; recording it in BaOI may help give us some dates. The new label design starts to be used after the initial dozen or so LP releases (orange labels appearing for a few more years, mainly on mono compilations of early singles as Tighten Up). Orange and white design labels sport the Trojan helmet logo and slogan printed in a somewhat purple shade of blue, this can vary and it may be the blue ink changing shade over time. 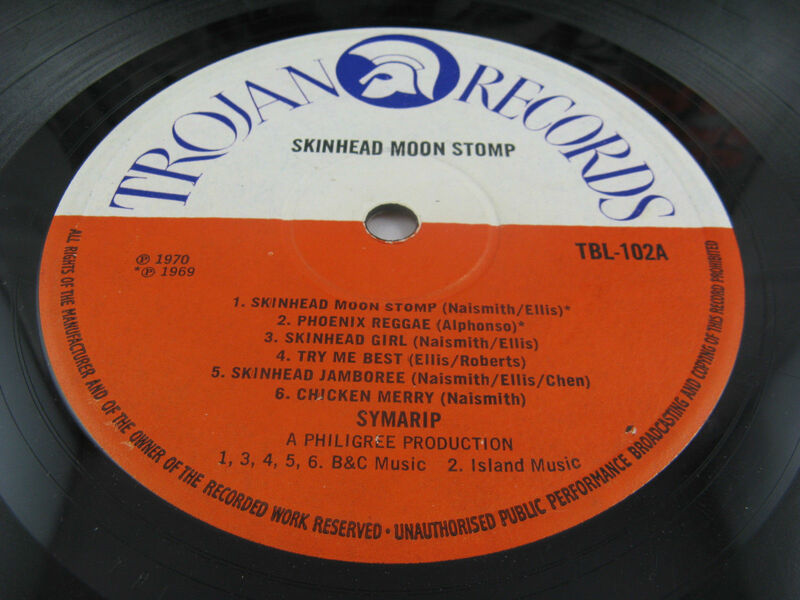 TRLS prefixed stereo editions have 'STEREO' in the same bold font below the cat#/label matrix. 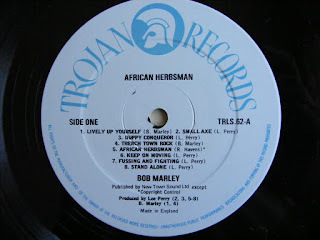 The title is usually placed in the upper part [white] of the label and the Artist below the track list; there are exceptions in Trojan subsidiaries like Harry J, Clan Disc and Downtown which appear at this stage [circa 1969] with Made in England usually added on the left of some represses with the same rough paper labels and stamped Orlake matrix, the title is sometimes seen on the lower part of the labels, leaving the white part blank; changes of font, especially for the artist credit, abound and I'm not sure whether there is a pattern, they just may be label variations, in any case produced between 1968 and 1971 for certain. Sleeves are still only laminated at the front and often credit C.C.S. 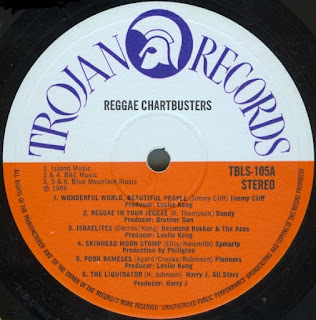 Advertising Associates Ltd. and/or Robert Stace who was also printing for B&C Music, B&C Records Ltd., B&C Recordings Ltd. B&C / Mooncrest Ltd. and B & C Records is credited for marketing Trojan from circa 1969. Some of these credits are usually removed on the reissues. 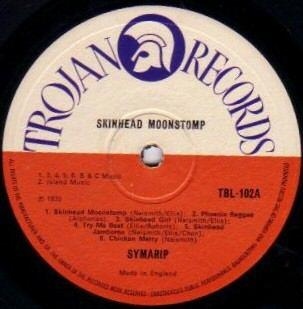 B&C Music is often among the publishers credited, this entity does not appear on 1980s orange/white label reissues. 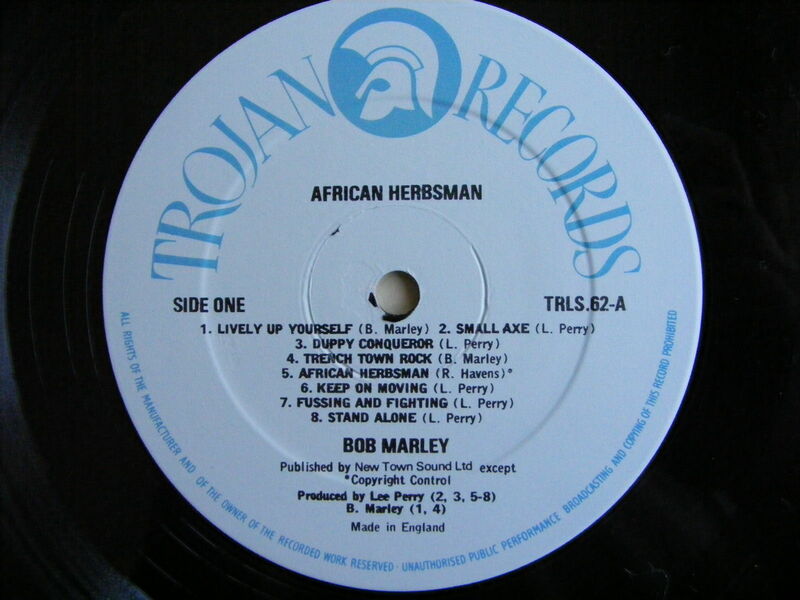 Other subsidiaries like GG's Records, High Note, Upsetter and Moodisc are given LP releases, some of these, like Herbsman Reggae on a redesigned Clandisc, stating 'Manufactured and distributed by Trojan Records Ltd.' on the labels. At some point [1970?] 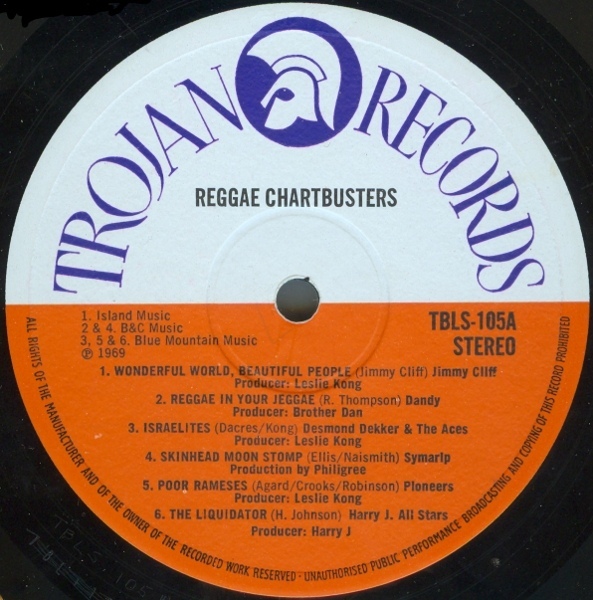 Made in England appears on the lower part of the label (probably to differentiate from Trojan albums that were being pressed in Jamaica (these often had UK made sleeves) and titles are again usually in the white part above the centre hole; there are exceptions, like on Monkey Man by The Maytals, where the bold text also appears smaller and variations may indicate several repressings. 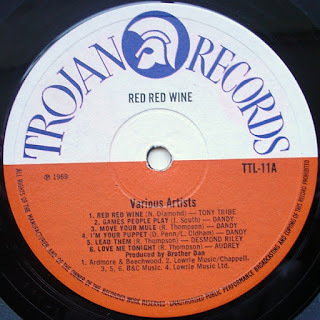 LPs prefixed TTL and TBL [TBLxxx on sleeve and TBL-xxxA and TBL-xxxB on labels] and their reissues have the same labels which appear to have unchanged into the 1970s with Trojan labels on the releases that previously appeared on subsidiaries, label text unchanged; From 1970 B&C Music is occasionally credited as printers alongside CCS on non-laminated sleeves and the labels start using capitalised artist credits [or Various Artists] instead af all caps, by 1973 labels use the bold font for title [at top] and artist [below track list],visibly wider than the '60s type while the cat# [derived from label matrix] still has a dot as separator [TBL.206]; additionally some of the later pressings appear to have smoother labels with the same ring as the sixties pressings. From circa 1974-75 [?] 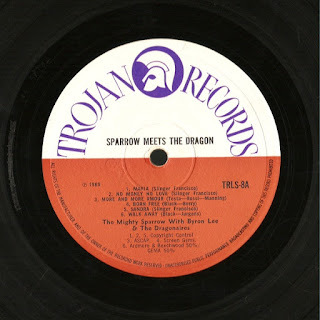 Trojan Recordings Ltd. started using EMI Records for contract pressings and alongside reissues with white and orange labels not too dissimilar from the previous Orlake versions but labels are smooth and the matrix in the run-out area would differ. In 1976 [?] the first grey and pale blue labels are introduced (also with a pale orange version and a pale green variation for 12" singles produced into the early '80s which often have 45 r.p.m. in a different font to the left). 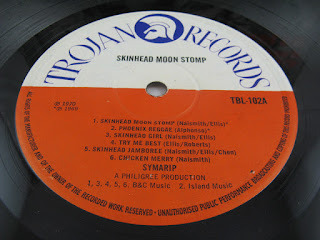 Sleeves are usually matte and some company credits and publishers changed; it also appears that the reissues from this time were recut from stereo masters and that some lacquers made by EMI were then pressed by Lyntone Recordings Ltd.
Once the relationship with EMI had ended, circa 1979-1980, the label was reacquired by Allied Records Ltd., evidence of this is found in the etching (ALI) usually preceding the run-out area matrix. At this point I am not sure Allied was doing the pressing or perhaps just the metalwork. 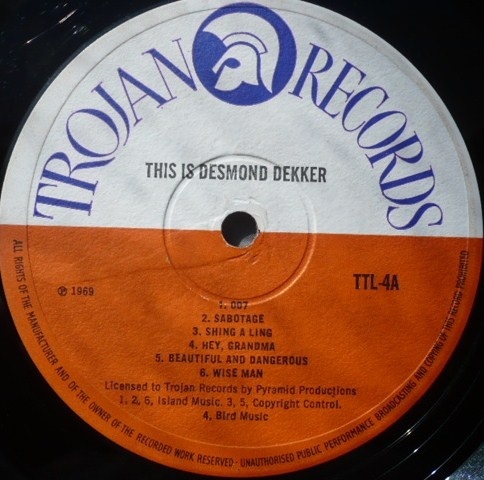 Again at this stage several editions revive the white and orange label design; some label graphics are copied exactly from the 60s editions while others are more easily recognisable due to the oversize 33⅓RPM to the left; in any case the labels are smoother than the Orlake pressings and sleeves are semi-glossy and reproduced from earlier editions, with or without barcode but usually crediting Trojan Sales Ltd., an entirely new entity with a new London W1 address. The 1990s releases usually are counterpart to a CD edition but the vinyl [either heavy or relatively thin] appears of inferior quality to the product of the previous decades, sometimes showing streaks in the plating and with the label surface often irregular and with the smooth white and orange labels featuring a variety of text styles. IMHO it's possible London plants P.R. Records Ltd. and Adrenalin were contracted, but I've not found any concrete evidence of this.